The 1925 Fiddler's Convention Mural was done as a community project. Cristy gathered together 20 interested people, taught them some basic skills in value and proportion, and then, using a grid, the team painted the 8'x12' mural. 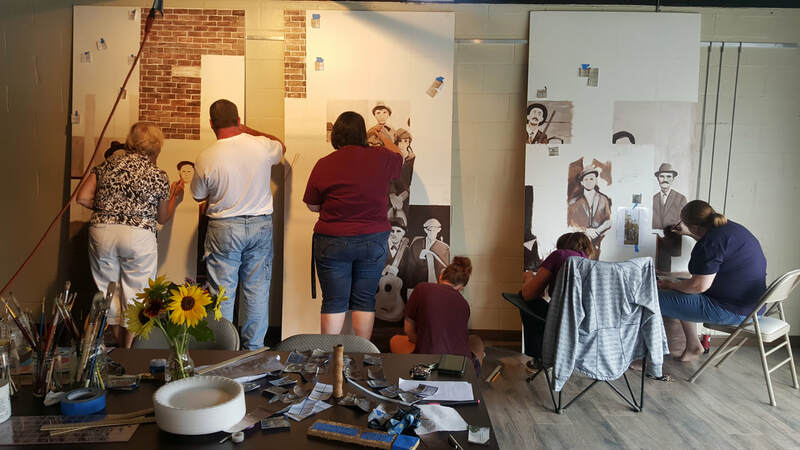 This was the first project done at Johnson County Center for the Arts, so while they painted, walls went up and lighting and air conditioning was installed around them. It was definitely a summer to remember! Stay tuned for another community mural project in July and August of 2019. In May 1925, an Old Time Fiddler's Convention was organized in Mountain City, Tennessee. This was the first big event of its kind, and the biggest names in early country music traveled from far and wide to compete for over $50 in prize money. The Old High School auditorium was filled to capacity and the floor nearly collapsed under the press of the crowd. The nearby courthouse and elementary school were opened to accommodate the overflow. This was the early days of radio and Tony Alderman of the Hill Billies set up a small, portable radio station to broadcast the event. Dud Vance and Charlie Bowman both took home prize money that day. The $20 gold piece offered by Buster Brown Shoe Company would have been worth more than $1000 today. Several legendary musicians were inspired to begin their recording careers by this watershed event. Clarence "Tom" Ashley, Bertie Jenkins, Walt Bacon, Argil Bowman, Uncle "Am" Stuart, John Rector, Fiddlin' John Carson, Al Hopkins, Fiddlin' Powers, G. B. Grayson , and Henry Whitter all went on to create records, and the original Hillbillies gave one of their earliest performances here. The old abandoned auditorium was renovated in the '90s by a community group under the leadership of Evelyn Cook, and now once again serves as Johnson County's performing arts venue, Heritage Hall. High quality and affordable performances are scheduled nearly every weekend.